The first Police University is well underway to enrich the South African Police Service with additional skills. On 30 January 2014, the Minister of Police (click here for his opening remarks) with the National Commissioner officially opened the first Police University in South Africa in Paarl, Western Cape. Owing to a partnership between the South African Police Service and the University of South African (UNISA), the first 125 students began their studies towards a Bachelor of Police Degree eagerly and with much anticipation. The establishment of the Police University is an achievement of one of the goals of the National Development Plan of Government to professionalize the South African Police Service. Ensure that the South African Police Service is able to remain innovative and able to respond to crime challenges facing South Africa. Produce officers who will render a professional service to the public and equip police members with skills to deal with complex international crimes. Help to instill discipline, police culture and patriotism among the members of the South African Police Service. Empower police members by developing their specialized knowledge and assist them to acquire specific technical know-how, as well as academic expertise. The University will offer a Bachelor Police Science Degree as well as Accredited Leadership and Management Programmes which will be tailored to suit the developing needs of the police. To become a leading police academy in Africa in the professionalisation of police through university education. In partnership with an internationally acclaimed university in Africa to provide Police Science qualifications and Leadership and Management qualifications. Planting and developing own timber for Professional Policing. Holistic development of future leaders within the South African Police Service and the continent. Developing Research Capabilities to ensure that SAPS becomes a research learning organization for effective policing. Attracting and developing Police Agencies from the Region; Africa and International Cooperating Countries. Ensuring the retention and preservation of police culture in the SAPS. The Academy, then known as a college, opened its doors on 2 January 1990 and was known as the SA Police College for Advanced Training. Training presented was the former Candidate Officers Course and Detective Training. On 22 July 1996 the college’s name was changed to the South African Police Service Training College, Paarl. The training of candidate officers was stopped. The focus shifted to supplying functional skills training. During June 2000 the college received instructions to develop and present an officers’ course focusing on functional skills. November 2001 saw the college going through yet another change when the Component Leadership Development and the college amalgamated. Head Office Training restructured during 2002. This led to the transformation of the College to the South African Police Service Management and Leadership Development Institute, Paarl. The South African Police Service was then a component with a diverse skill base and had a considerable responsibility towards the larger police service. The daily task of this institute was to train, educate and develop the officers’ corps of the South African Police Service in support of the operational, as well as organisation priorities of the South African Police Service. On 12 September 2006 the name of the Institute changed from the South African Police Service Management and Leadership Development Institute, Paarl to the South African Police Service Training Institution, Paarl. The daily task of the Academy is still to train, educate and develop the officers’ corps of the South African Police Service in support of the operational, as well as organisational priorities of the South African Police Service. The Nelson Mandela University in Port Elizabeth developed a new officers’ programme for the South African Police Service, focusing on training, educating and developing the candidate officers. The pilot programme was launched on 30 April 2007 and is known as the Junior Management Learning Programme. The Executive Management and Leadership Development Centre, Paarl officially opened its doors on 11 June 2009. The Executive Centre was develop to train senior officers (Generals and Brigadiers) of the South African Police Service in the Executive Management and Leadership Programme. The South African Police Service Academy Paarl and the Boland Academy, Paarl amalgamated on 1 April 2011. The Boland Academy was renamed the South African Police Service Operational Centre, Paarl. The personnel moved over to the main campus and a renovation project was initiated to upgrade the facilities to host the operational programmes. 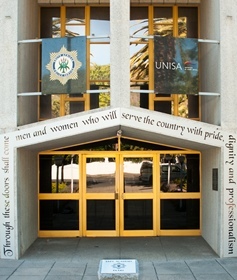 On 22 October 2013 the announcement of the partnership between the Department of Police and the University of South Africa (UNISA) in the establishment of a police university in Paarl was celebrated at the SAPS Academy, Paarl. The Academy will now enable SAPS members to study full time for a Bachelor degree in Policing. The UNISA and the SAPS officially opened the first police university at the SAPS Academy Paarl on 30 January 2014. The institution has enrolled 125 student for the 2014 academic year.